‘Buffet Tycoon' is an exciting time management game. You will manage a ‘Buffet restaurant'. 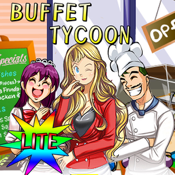 You may experience the reality of buffet restaurant business in this game. handle your waiter and chef to make customers feel comfortable during the meal. Chef should cook busily not to bring about shortage of food. Waiter has to keep guests’ table clean and carry what they want. You can train your employees to serve customers faster to earn extra money firmly. You must consider the loan from your bank. earn more money and finally you can accomplish the goal of your business. -Real business situation of buffet restaurant. -lots of different customers to serve. Never miss this game, if you want a creative and substantial entertainment. Easy and addictive ' Buffet Tycoon’ will keep your adrenaline going.